Will we be celebrating on Thursday? A little over a year since Ireland began their campaign with a last-gasp win in Tbsilisi, their quest to reach Euro 2016 comes to a head with a make-or-break double-header this week. It’s been far from plain sailing for Martin O’Neill’s men but they’ve reached this juncture of the campaign knowing they can secure a play-off berth with one game remaining. As the squad convened in Abbotstown this morning, Shay Given admitted he was finding it difficult to get his head around the permutations as a keenly-fought group reaches its climax. Ireland, along with Germany, Poland and Scotland, are all vying for two of the automatic qualification berths for France 2016 with the side who finish third entering the lottery of the play-offs. With a home tie against world champions Germany and a trip to Warsaw bringing the curtain down on the campaign, Ireland’s run-in couldn’t be any tougher but they might be let off the hook by results elsewhere. But, as we all know, football is rarely that straightforward and there’s sure to be some twists and turns over the course of the weekend. All games, except for Georgia-Gibraltar, kick-off at 7.45pm. The top-two sides qualify automatically for France while the third-place team will go into a playoff (unless they are the best third-placed side across Europe, in which case they also qualify automatically). While we’re ever the optimists, all you need to know is that if Ireland can match or better Scotland’s result against the Poles on Thursday, then they are guaranteed third place. Alternatively, a Polish win in Glasgow would see the Boys in Green over the line – regardless of what happens against Germany. You still with us? It’s not that complicated, really. In the unlikely scenario Ireland manage to win both games, you can start booking your flights and brushing up on your French because we’re off to the Euros, baby. But let’s be realistic and not get carried away. Now that we’ve all calmed down, let’s look at the other possible scenarios. Ireland earn four points from a possible six: If Ireland beat Poland and draw with Germany, they’d be on 19 points and assured of a top-three finish. They would also be guaranteed second if Poland fail to beat Scotland. Alternatively, if Ireland beat Germany and draw with Poland, they would need Scotland to beat Poland or Georgia to beat Germany to be guaranteed a top-two finish. In the second scenario, if Poland draw with Scotland to go level on points with the Irish, the Boys in Green would likely have to settle for third by virtue of the Poles’ current far superior goal difference, unless they secure a high-scoring draw (i.e. greater than 1-1), which would mean Ireland qualify on away goals. Ireland earn three points from a possible six: If Ireland lose to Germany and beat Poland, it would leave them on 18 points and guaranteed third place. They would also finish second and qualify if Poland fail to beat Scotland — if not, they’d have to settle for third. If Ireland beat Germany and lose to Poland, they would again be destined for the third spot. Ireland draw both their remaining games: This is where it gets a little nervy. If Ireland draw with both Germany and Poland, they would almost certainly have to settle for third, unless Scotland beat Poland, in which case, they will be eliminated outright, with Scotland level on points with the Irish but possessing a superior head-to-head record (which comes into play before goal difference is taken into consideration). Ireland earn one point from a possible six: If Ireland lose to Germany and draw with Poland, they will finish third so long as Scotland don’t beat Poland and eliminate the Boys in Green in the process. Similarly, if Ireland draw with Germany and lose to Poland, they will finish third so long as the Scots don’t beat the Poles. Ireland lose both their remaining games: Ireland can still come third and reach the playoffs, though the difference from the above mentioned scenarios is that Scotland would only need a draw against Poland to leapfrog Martin O’Neill’s men in the group. Right, so that’s clarified then. As well as supporting the Boys in Green on Thursday evening, make sure you’re keeping an eye on the game in Glasgow. With reporting from Paul Fennessey. Email “Squeaky bum time! Here's what needs to happen for Ireland to qualify for Euro 2016”. Feedback on “Squeaky bum time! 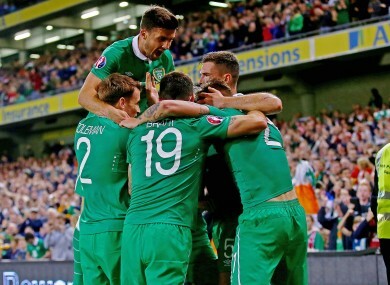 Here's what needs to happen for Ireland to qualify for Euro 2016”.